When looking at flooring options, carpets and laminate floors are popular choices. Their cost is usually comparable and is cheaper than solid hardwood flooring. Roughly half of new flooring sold in America every year is carpet. Laminate flooring is considered more hygienic and hypoallergenic than carpet, as it is easily cleaned, and dirt won't go unnoticed. Carpet tends to retain dust and pollen, stain more easily, and build up mold and mildew when exposed to moisture, making it a less desirable option for those who struggle with allergies. The two flooring types are similarly priced, but high-end, "high pile" carpeting will likely cost more than high-end laminate flooring. Installation costs must also be considered, with the tongue-and-groove planks often found in laminate flooring making installation relatively easy and popular with the do-it-yourself (DIY) crowd. Carpet can also be self-installed, but not as easily. Carpet, which is made from wool or a synthetic fiber, such as polypropylene, nylon, or polyester, is attached to a backing that is generally nailed or stapled to the floor and any padding underneath. Laminate flooring is a multi-layered synthetic product made from fiberboard materials and melamine resin. One layer of laminate flooring is dedicated to a photographic appliqué that generally imitates wood and sometimes stone. Usually 3-5 years (average quality); 10-15 years for top quality carpet. Good laminate flooring is less prone to some of the problems that plague hardwood. Most laminate floors will need to be replaced after 15-25 years. Lower quality brands may need to be replaced sooner. $3-$5 (installed) per square foot. $3 to $11 per square foot, including cost of installation. Usually a synthetic material such as nylon, polyester, or polypropylene. Laminate flooring is a synthetic fiberboard product. Usually has four layers: a stabilizing layer, a layer of treated high-density fiberboard, a photographic pattern layer, and a clear melamine resin layer. Extended exposure can cause mold and mildew. Some resistance; cannot handle standing water. Steam cleaning, patch replacements, full replacement. Keep clean and free of moisture, avoid causing damage, use pads on the feet of furniture. Do not let water sit. Cannot be sanded or refinished. Fibers hold on to dust, dirt, bugs and bacteria — can aggravate allergies. Some VOC emissions. Uses melamine resin, a compound made with formaldehyde. Usually produced from non-renewable materials and emits small amounts of volatile organic compounds. Difficult to determine environmental impact. Common for recycled materials to be used, but is also made with a resin composed of melamine and formaldehyde. Formaldehyde emissions may be cause for some environmental and health concerns. No Yes, easy clean up. Cannot withstand standing water. Prone to stains, trapping dust, mold and mildew. Highly durable. Laminate flooring is usually made from high-density fiberboard or wood particles. There are typically four layers in a laminate flooring plank, including a stabilizing layer, a layer of treated high-density fiberboard, a photographic pattern layer, and a clear melamine resin layer. The clear, hard layer is placed on top of the other layers to boost durability. Carpets come in many different styles, including woven, needle felt, knotted and tufted. All styles have an upper layer of pile – the frilly, soft yarns that stand up on the flooring — attached to a backing. Modern carpets often provide ultra-soft fibers and stain resistance, by way of technology that tightly combines synthetic molecules close together, making fibers smaller in diameter. While most carpeting is made from petroleum-based synthetic materials, natural wool is the softest and most durable option. It is, however, also the most costly, and accounts for only 1% of sales. As such, nylon, which is the more durable of the synthetic carpet materials, is the most commonly used material in the construction of carpets. Both carpet and laminate flooring provide users with a wide range of design options. Laminate tends to come in designs mimicking natural flooring options, such as wood and stone, and the range of colors, patterns, and piles of carpet available are almost limitless. Carpet is the warmer option, often used in bedrooms where one is likely to be barefoot. It is also an acoustic insulator, cushioning noise caused by movement. Laminate flooring does not absorb sound well and is often noisy to walk on. Acoustic underlays are sometimes used to help reduce noise. Laminate flooring tends to provide a more versatile base for interior decorating due to its resemblance to natural products. One generally won't have to worry about clashing colors, a consideration carpeting may necessitate. Bright or decorative carpets may suit one's style now, but might be difficult to incorporate into new décor choices in the future. A Lumber Liquidators' survey found that 100% of real estate agents polled preferred hardwood floors to carpet. Laminate flooring can give the highly sought-after hardwood look for less. Though buyers will know it's not hardwood, laminate can make a home look more modern and open, and will often add to resale value. Though not considered ‘trendy', carpeting is making a comeback, with the World Floor Covering Association noting a 3% to 4% increase in carpeting sales in the last few years, and 50% to 55% of flooring sold yearly attributed to carpeting. However, as laminate flooring is typically more stylish, easier to maintain, and longer lasting, it is more likely to improve the resale value of the home than carpeting. 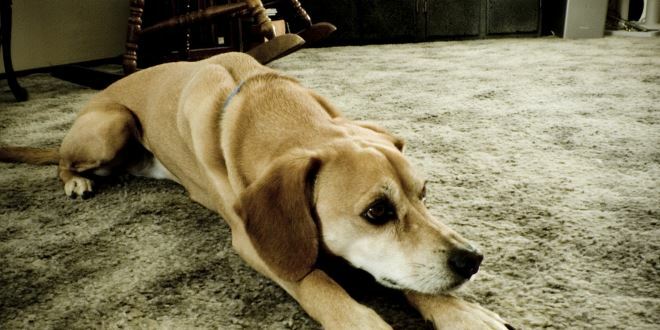 Laminate flooring is likely to last much longer than carpet, as it is scratch-resistant, durable, and easy to clean. While carpet will generally have to be replaced in 5 to 10 years, quality laminates can last up to 25-30 years. More expensive laminate flooring is often a better investment, though carpet provides a cheaper option should users wish to renovate more frequently. Modern carpeting is more durable and stain-resistant than in the past, but it's generally accepted that it won't last more than 10 years in any areas with moderate traffic. Carpet can be installed over many materials, from concrete to wood, and can hide slight irregularities in a floor. Carpet and padding are first trimmed to the correct dimensions, and then the two layers are installed with nails or staples, and seams are glued down. Installation in a large room requires stretching of the carpet and special tools. Although users can install carpet themselves, particularly with some “peel and stick” brands making DIY jobs easier, carpet generally requires professional installation. Laminate flooring can be installed on top of almost any existing floor, excluding carpet, but if special preparation of the floor is required, users may need professional services. Tongue-and-groove laminate flooring products make DIY installation easier, and also lower the costs of professional installation due to the speed and ease with which tongue-and-groove planks can be installed. It is essential that homeowners follow a manufacturer's installation instructions when installing laminate flooring, as doing so will ensure the longevity of the product. For instance, when installing laminate flooring, it is important to leave a small gap between the wall and the edge of the flooring, to give the boards room to expand. Without this gap, flooring is likely to push up, or buckle, in the middle of the room, creating an unleveled floor. Spills on carpet should be cleaned immediately to prevent stains and mold. Mats placed at entries and exits help to keep dirt off carpets. To ensure cleanliness, carpets should be vacuumed twice a week in low-traffic areas and more often in high-traffic areas. They benefit from a deep-cleaning hot water extraction cleaning every 12-18 months. Leaving pools of water to stand will damage laminate flooring and carpet, both of which may then require replacement. Unlike hardwood and some nicer engineered hardwood, laminate floors cannot be sanded and refinished. Also, though moisture resistant, laminate will warp in high-moisture areas, such as bathrooms, particularly if installation is not done correctly. Users should place protective pads on the bottoms of chair and table legs to prevent scratching. Manufacturers generally suggest waterless cleaning for laminate floors, or mopping with special products that leave the floors dry. When carpeting is damaged, one will generally have to replace the entire carpet. Laminate flooring offers the advantage that small sections can be replaced, as needed, to repair damages. The range of costs for both products depends on the quality and style selected. Carpeting can generally be purchased for $2 to $15 per square foot, installed; and laminate for $3-$11 per square foot, installed. With carpet, a higher, plusher pile tends to equal greater expense, and wool is the most expensive fiber used in the flooring. When it comes to laminate, homeowners should be careful with cheaper brands, as they may not be as durable. When comparing prices for laminate and carpet, be sure to factor in the warranty period. Laminate floors can be significantly cheaper if they aren't very high quality and only offer a 10-year warranty. Higher-end laminate will offer better warranty (25 to 30 years) but is usually worth it. Many homes use a combination of carpet and hardwood or laminate flooring. Carpets are not a good choice for kitchens and dining rooms, for example; laminate will work better in those situations. Bedrooms tend to use carpet more often for their warmth and softness. Laminate works better if you are a landlord and need flooring options for your rental property because carpets tend to show more wear and stains from mud and liquid spills. Using laminate or hardwood on stairs can increase the risk of tumbles because the stairs become more slippery. This is especially true for people who prefer to wear socks at home. Another consideration is style and what matches the rest of the interiors of the house. Laminate flooring is not suitable in basements that have flooding problems, or even moisture due to excess humidity in the basement. Carpets can also be warmer in cold basements. Linoleum and vinyl floors are also an excellent option for basements. Laminate flooring tends to be easier to clean than carpet and is thus considered more hygienic and hypoallergenic. The Rug Doctor's study of carpets showed high levels of dangerous bacteria, hidden dirt, pollen and dust mites, suggesting consumers are unable or unwilling to properly clean their carpets. In an overview of the science on public health and housing conditions, James Krieger of the University of Washington and Donna L. Higgins of the CDC point out that old carpeting can aggravate allergy symptoms, as the fibers catch and hold dirt, allergens, pesticides, and toxic chemicals. In an attempt to address allergen concerns, today many carpets are made with more earth-friendly chemicals and fewer chemicals altogether, so low-VOC (volatile organic compound) products are available for sensitive consumers. The Center for Health Design's review of research notes that though some studies point to carpet being vulnerable to fungi and bacteria contamination, the results are conflicting. Some find higher concentrations above carpeted floors and others above hard flooring, suggesting further study is required. Though laminate flooring is often made of melamine resin, a compound made with formaldehyde, the formaldehyde is more tightly bound than in urea-formaldehyde, reducing emissions and potential health effects. Moreover, laminate flooring can be recycled, with some manufacturers able to reuse up to 80% of materials. The pile of carpeting is generally made from nonrenewable materials, and small amounts of unhealthy VOCs can be released from installed carpets due to the chemicals used in manufacturing. VOCs can be released for up to 5 years, though this chemical release, known as off-gassing, lessens with time. For this reason, homeowners are recommended to keep rooms with new carpet installations well-ventilated for at least 72 hours, post-installation. Vacuuming a new carpet with a HEPA filter vac and using hot water extraction cleaners can help remove VOCs. Though there are more green carpeting options available that use renewable materials and avoid dangerous chemicals, these options come at a premium price. 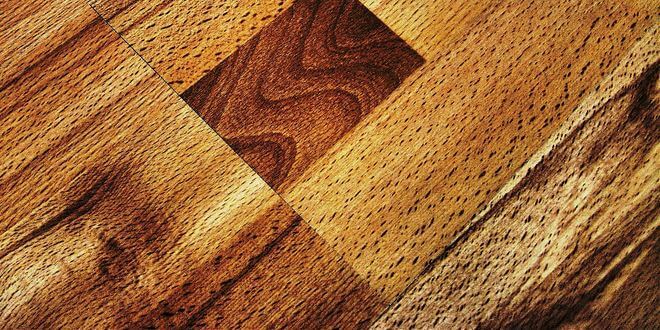 Hardwood flooring and engineered wood flooring tend to be more environmentally-friendly and sustainable than either carpeting or laminate.